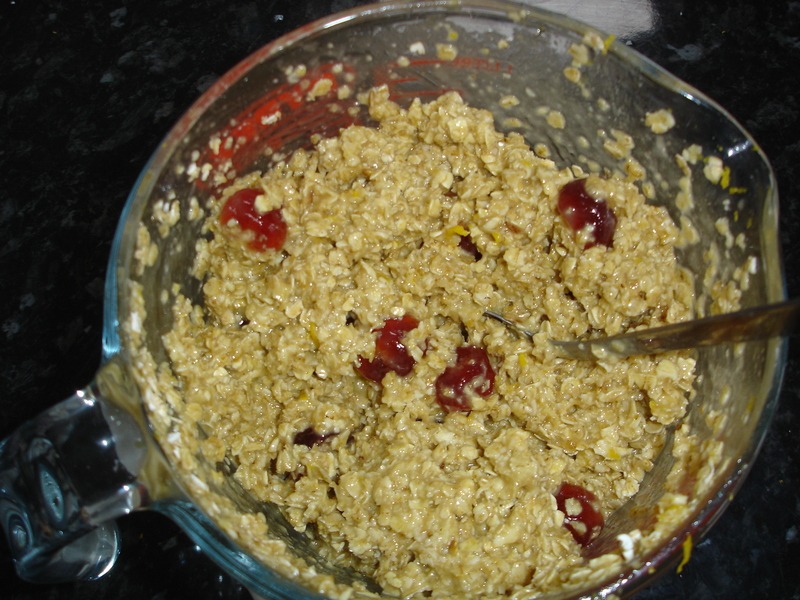 Cherry and Orange Flapjack | Keeps Me Out Of Mischief! A lot of my cooking comes from the need to use up things that I’ve bought too much of or forgotten to use in another recipe (oops!). This recipe arose from the latter – an orange that I’d bought to make a lovely zingy salad dressing with was looking very lonely in the fruit bowl. I do this a lot; I buy things to use for recipes I’ve found and then forget them at the last minute and don’t remember until I’m eating it and think ‘oooh, this couscous salad would have been lovely with a bit of zing to it!’ Sometimes it leads to an undiscovered gem or an ‘unrepeatable’. This, I hope you’ll agree is an undiscovered gem! The couscous was, unfortunately, an unrepeatable! Preheat the oven to 180°/ Gas mark 4. Grease and line a 20cm x 25cm baking tin. 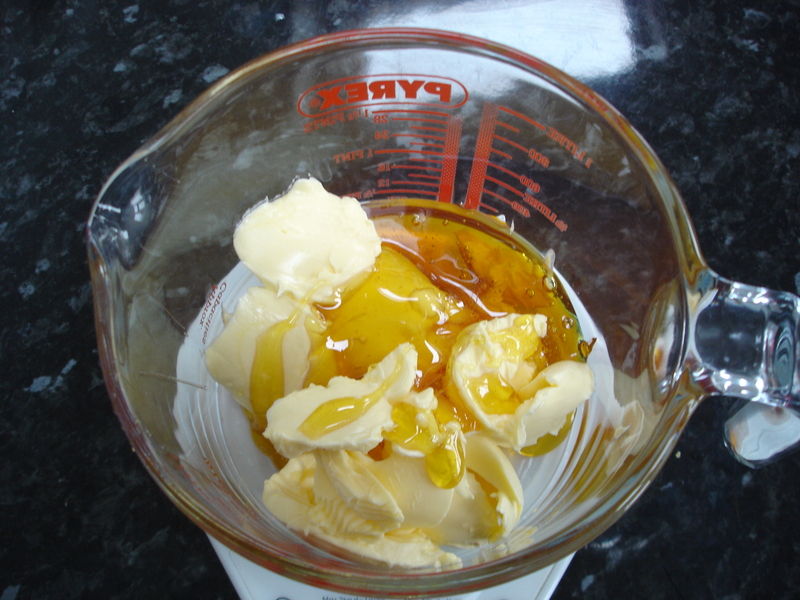 Place the golden syrup and margarine in a microwave proof bowl. Melt the mixture in the microwave (or on the hob in a saucepan). 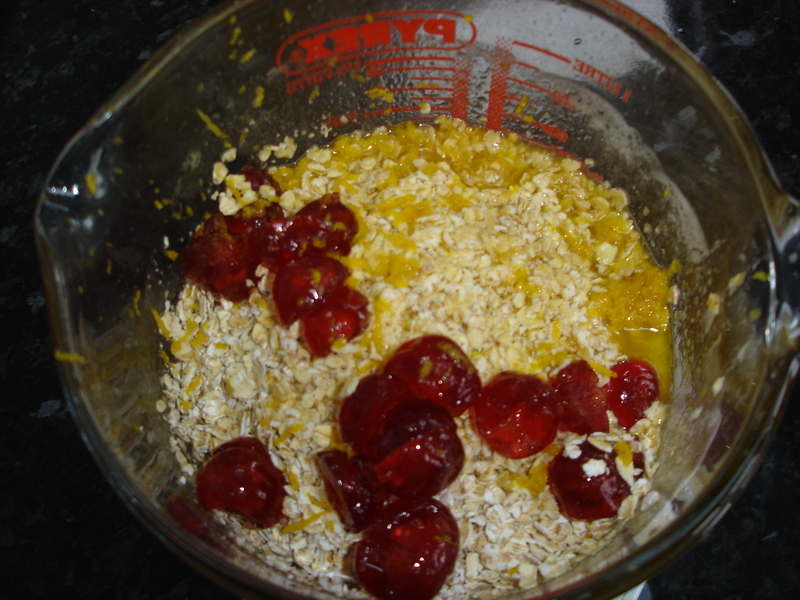 Add the cherries and the zest and juice of the orange. Mix the ingredients until everything is well covered in the syrup/ margarine mixture.Put the mixture in the baking tray and smooth the top with the back of a spoon. Bake in the oven for 30 minutes or until golden brown on the top, the flapjack will still be slightly soft. Put the baking tray onto a cooling rack and cut squares/ slices while it is still in the tray. Let it cool completely in the tray – if you can resist it! Will keep in an airtight for container for…. well, we’ve never actually found out… much too tasty! These look delicious! 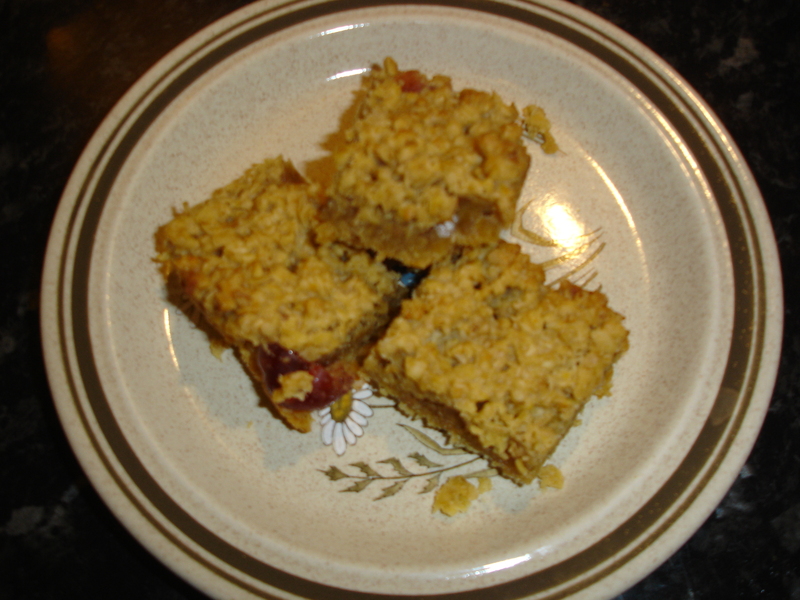 I didn’t know that the word “flapjack” referred to something baked in the UK. In the US I think it means pancake. Over here it’s a sugary oaty confection! Good for putting in lunchboxes and really good with custard for an emergency pudding!